Among the many types of weeds we combat every year, crabgrass is one of the most frustrating. Here are some tips that will help you to stop it from taking over your lawn. It’s not clear how crabgrass got its name. The prevailing theory, that it’s ugly and tough, has a lot of “legs,” or fingerlike stems, and spreads by creeping along the ground like a crab, is not very convincing. As its yellowish-green leaves extend, it looks more like a starfish than any other form of sea life. It doesn’t aggressively try to crowd out your primary grass, but it does spread easily because it produces a lot of seeds. While its annual die-off when winter arrives might be cause for brief celebration, the bald spots it leaves behind are not a major improvement in the attractiveness department, and those seeds are just biding their time until the return of spring. Reseeding Bald Spots – This enterprising weed will take root wherever it finds space. Reseeding will cut down on those opportunities. Increasing Your Mowing Height – Cutting your grass too short is another invitation for crabgrass growth. Leaving blades longer will help to shade soil from the sunlight that the crabgrass seeds need in order to germinate. Being Alert to Weather – The ideal environment for crabgrass is heavy rain in spring followed by a hot summer. We obviously can’t control the weather, but we can be extra alert and prepared if conditions follow this pattern. It’s much easier to stop crabgrass before it starts than it is to fight it once it’s entrenched. Unfortunately, no method, even our excellent pre-emergent, is 100% effective. Here’s how to take on the plants that slip through your defenses. 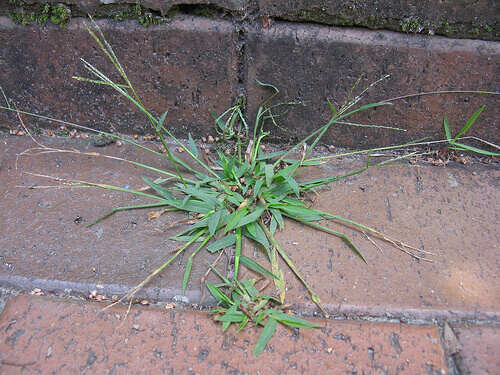 Hand Pulling – Because of its fondness for bare spots, crabgrass often appears in cracks in pavement or along the edges of driveways and walkways. As with any weed, it’s important to be sure that you’re pulling out the entire root system. Unlike many weeds, crabgrass has shallow roots that make this relatively easy. Applying a Herbicide – Pre-emergents are only effective on seedlings as they’re germinating. A different herbicide is required for crabgrass that is past that stage. Fertilizing – As we suggested above, fertilizing your lawn will help your grass to remain thick and healthy, reducing the number of thinning or bare spots that crabgrass finds so inviting. Healthy grass is also more resilient when other types of weeds try to claim territory. If we can help in any way with your battle against crabgrass, call us at 334.466.0600. One of our highly trained lawn specialists will visit to assess your situation and make recommendations. Together we can keep your lawn free of all unsightly weeds and diseases and looking its best.